More than 200 enthusiastic Texas music educators and drum corps fans joined Drum Corps International on Friday, Feb. 17, at the AMC Rivercenter movie theater in San Antonio as an offshoot activity of the TMEA convention. DCI executive director Dan Acheson and Jeff Fiedler, corps director of the Cavaliers, made introductions and thanked those in attendance for their continued efforts to support music education and the arts in Texas. Acheson also revealed the corps that will appear in the 2006 Classic Countdown. 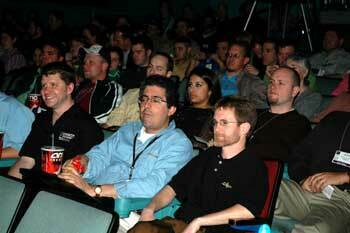 Attendees were treated to a sampling of a "DCI Cinema" event, while watching the 2005 "finals night" performances of the Cadets, the Cavaliers and Phantom Regiment. After the screening, Angela Robertson, a current band director at Waco High School in Waco, Texas, who last year as a director in Tennessee took 20 of her students to see the 2005 DCI Classic Countdown in St. Louis., offered her input about the DCI cinema programs. "The DCI theater events are no doubt something I would take my students to again. For those who can't make it out to the big shows, putting a DCI event in the theater makes it accessible to them," Robertson said. "Also, it's great for the small schools that don't have the budget to take students all the way out to the World Championships. These cinema events are great motivators for marching band students, especially in the summer coming into the band camp season." Drum Corps International will again offer two cinema events this year. The 2006 DCI Classic Countdown is scheduled to appear in select theaters on April 27, and DCI Cinema Live, the live cinecast of the 2006 World Championship Quarterfinals, will be part of National Cinemedia's Big Screen Concert offerings in August.